For some reason, probably simple curiosity, I tried an old spinach variety called Giant of Viroflay this spring. 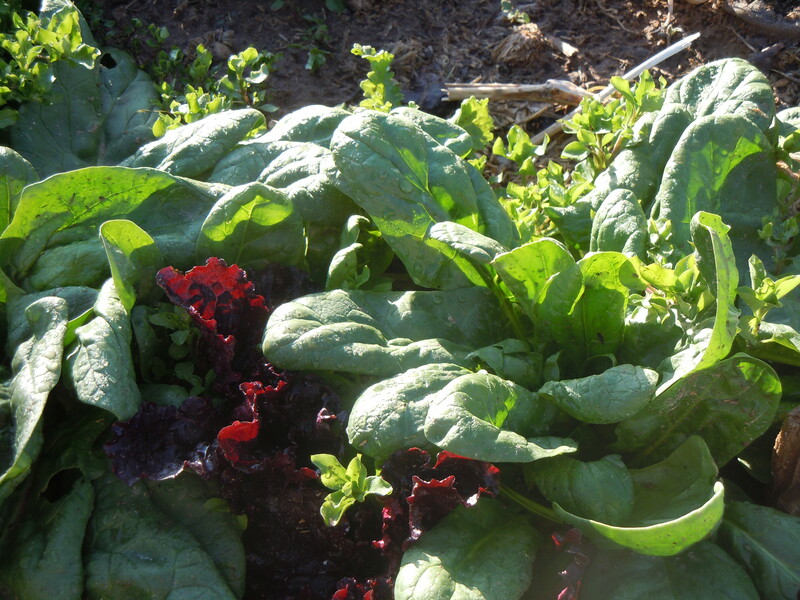 It was a hot, early spring with lots of wind and duststorms, and I didn’t think that this European antique would survive our high-desert climate, but in fact I have never had such a good crop of spinach. The leaves are smooth and about 10″ long,and in the current June heat I’m still picking from the row that I started harvesting in early May. The particular strain that you have can make a big difference. I got mine from Nichols Garden Nursery. I have seen seeds around labeled “Giant Noble,” which may or may not be the same thing. The maintenance of a good line of seed takes a lot of attention, and it pays to get your seed from the best source that you can find. The flavor is wonderful, full of the richness that good spinach has, with no metallic or bitter flavors. The texture is smooth and melting when cooked properly, and wonderful in salads too. 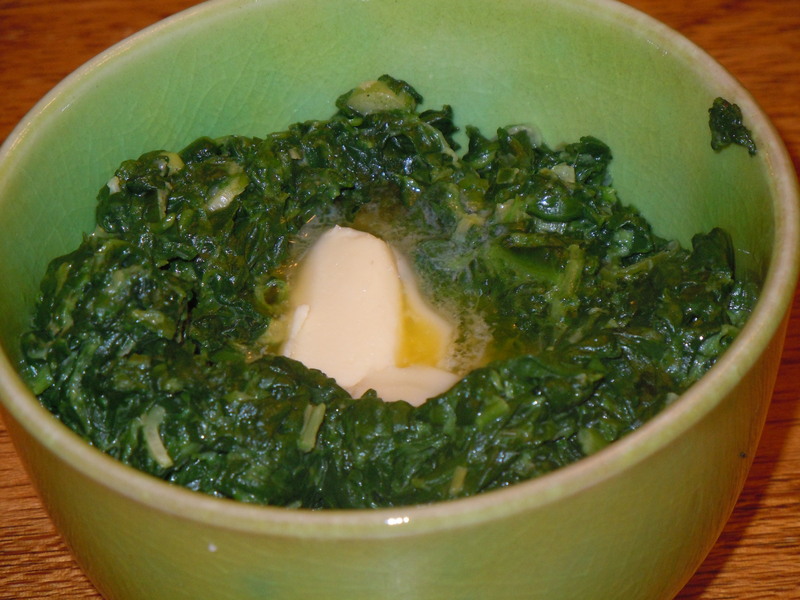 When I have spinach this good, I like plain creamed spinach more than any other way of cooking it. I think that the French method of blanching first produces the best flavor, and I make up for any diminishment of water-soluble vitamins by eating a great deal of it. Pick a lot of spinach, since it shrinks greatly when cooked. I use a 5-gallon food-grade pail to pick into, and pick it 2/3 full (loosely filled) to serve 4. Wash very well three times in sinkfuls or pailfuls of cold water. Don’t neglect the washing step. Any bit of grit will spoil your perfect spinach. Then bring a gallon of water to a rolling boil in your big stockpot, toss in the spinach, DON’T cover the pot, and stir with a wooden spoon to get all the leaves exposed to boiling water. When the water returns to a full boil, stir and boil for another minute, then drain in a colander and press ALL the excess moisture out. Turn out on a clean cutting board, chop rapidly with your big chef’s knife, and put in a saucepan with a few tablespoons of butter, half a cup of heavy cream, and salt to taste. Cook over high heat, turning regularly, until the cream is reduced and there’s no drippy liquid. Serve forth promptly, with a little more butter on top. If you know someone who has a Jersey cow, your cream can be thick raw Jersey cream, which is the best cream there is. Shave a few shreds of fresh nutmeg on top just before it goes to the table (I do mean a few, 1/8 teaspoon or thereabouts.) Some fresh pepper is nice too. Sometimes I add some sauteed shallot or green onion, and sometimes I feel that alliums impair the delicacy of the thing. I like to eat this as a meal all by itself, with a few slices of good baguette alongside. It also makes a great base for poached eggs, and accompanies delicately seasoned chicken and fish dishes beautifully. It is one of the joys of late spring, to be enjoyed lavishly in its season.